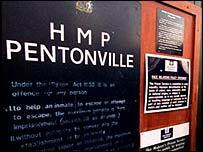 Overcrowding is to blame for "substantial deficits" at Pentonville jail which include prisoners having showers just once a week, the chief inspector of prisons has said. Anne Owers said the north London prison's daily regime - including time prisoners spend out of cells and access to education - was "one of the most impoverished we have come across". Britain's rocketing jail population - which last Friday stood just below the all-time high of 73,000 - meant Pentonville was unable to offer decent standards, she added. Staff were unable to provide prisoners' basic requirements such as adequate access to showers, clean clothes and telephones, Ms Owers said. "We expect prisoners to have access to daily showers and changes of underwear. "In many areas of the prison, this was happening barely once a week," she added. The inspectors, who made 57 recommendations for improvement after their unannounced visit last September, noted that staff shortages had led to disruption in education. Out of cell activities were "unpredictable and unacceptably low", with just 20% of inmates able to attend classes despite the proportions of those with reading and writing difficulties being about 40% and 70% respectively. The jail was not carrying out risk assessments on inmates required to share cells, and work to stop vulnerable inmates harming themselves required "considerable improvement", the inspectors said. But the report also praised the work done by Pentonville in healthcare, offending behaviour programmes and drug schemes. At 25%, the proportion of black and minority ethnic staff was significantly higher than in other prisons, inspectors said. In conclusion, Ms Owers said: "We suggest that, with the new staff in place, the governor and area manager together should review the regime and activities and realistically assess what the prison can provide. "If that analysis identifies that there cannot be a decent regime unless there are fewer prisoners, or more staff, that message needs to be sent clearly to the Prison Service, ministers and the public." Director general of the Prison Service, Phil Wheatley, said: "In my view, Pentonville today is a safe and decent prison coping professionally and compassionately with the huge numbers of prisoners passing through the gates every day." The jail was completed in 1842 and can hold up to 1,200 inmates at a cost of £26,000 per prisoner a year. "The report found the jail was holding prisoners in conditions that were all below basic standards."